Yamaha’s RX-V590 sits close to the middle of the company’s A/V receiver lineup. Its power ratings, 75 watts each for the three front channels and 25 watts for the two surround channels, are typical of models in the RX V590’s price range. What’s unusual are the receiver’s multiple digital signal-processing (DSP) functions for ambience enhancement of both sound tracks and music recordings. Called Cinema DSP, the circuitry is a descendent of Yamaha’s highly regarded concert-hall-simulating digital ambience enhancement. The system emits from the front and surround speakers numerous digitally derived “echoes” or, more accurately, “reflections” that are different in each speaker and vary in spacing and intensity depending on what kind of performance space is being simulated. Eight processing modes are provided, including standard, unmodified Dolby Pro Logic with just the usual single delay applied to the surround channel. Dolby Pro Logic Enhanced is said to simulate “the multi-surround speaker systems of a 35mm film theater.” Concert Video is meant for music videos as well as operas. The remaining modes are Mono Movie, Stadium, Disco, Rock Concert, and Concert Hall. As usual, such labeling should be used only as a guide to the size of the performance space being simulated. It’s to your advantage to experiment with matching the processing mode to your music. Both the front panel and the remote carry controls for adjusting the relative levels of the center and surround speakers a critical alignment necessary for the most realistic spatial enhancement as well as for the proper reproduction of soundtracks — and for turning on the built-in level-adjustment test signal. You can also adjust the surround-output delay time, which sets the period between the emission of the main front-speaker sound and the first emission of the digitally processed sound from the main front and surround speakers; no synthetic reflections are added to the center channel in any of the modes. Other front-panel facilities include buttons controlling the forty-preset AM/FM tuner; switching for two sets of main speakers; a quarter-inch head phone output; bass, treble, and balance controls; and an A/V input for temporary hookup of camcorders or video games. Signal sources selected by a bank of eight buttons to the right of the display area include four that are audio-only (tape monitor, tuner, CD, phono) and four that are audio/video (video aux, VCR 1 and 2, and LD/ TV). All video connections carry composite-video signals; there are no S-video facilities. The remote control is a universal programmable model that includes the only access to the receiver’s sleep timer, which can be set in half-hour increments up to 2 hours. There is no mute control anywhere, but that function can be performed simply by switching to an unused input. Hookup posed no special problems, the back panel being well laid out and equipped. The main speaker outputs are binding posts that take dual or single banana plugs or stripped wires, while the center and surround speaker outputs are spring connectors. Connections for external sources are all phono connectors deployed horizon tally across the bottom of the rear pan el, with the video connections of A/V sources conveniently located directly above the corresponding audio jacks. Other rear-panel facilities include an F-connector FM antenna terminal, spring-connector AM antenna terminals, two switched AC convenience outlets, and a full set of line-level surround-decoder outputs, one of which is designated for subwoofer hookup. Overall, the RX-V590’s lab-test performance was considerably better than P average, aided in no small measure by the ample output power, which remained strong even into 4-ohm loads. The FM tuner also produced uniformly good numbers. The only disappointing figures were AM frequency response, which was, as usual, dismal, and front left- and right-channel frequency response, which exhibited deviations at the extremes of the audio range caused by slight offsets in the tone-control circuits, something we’re seeing more of nowadays than we would like to (or used to). Although not affected by the tone controls, the center channel showed slightly more rolloff than the other front channels, whereas the surround channel’s response fell more slowly above 7 kHz than usual. All the other Dolby Pro Logic figures represent very good performance, especially channel separation, which was better than we usually see from Pro Logic decoders that use analog circuits rather than the digital ones in the RX-V590. Impulse testing revealed that all the reflections for the non-Pro Logic DSP modes occur within, at most, a 400- millisecond “window” after the original sound; there is no sound recirculation or added reverberation. With a single big exception, the receiver was easy to operate. I liked the separate-button access to each of the surround-sound modes, enabling rapid changes between them. I also liked the on/off button for the surround processing, again because it enabled swift comparison between processed and unprocessed sound. 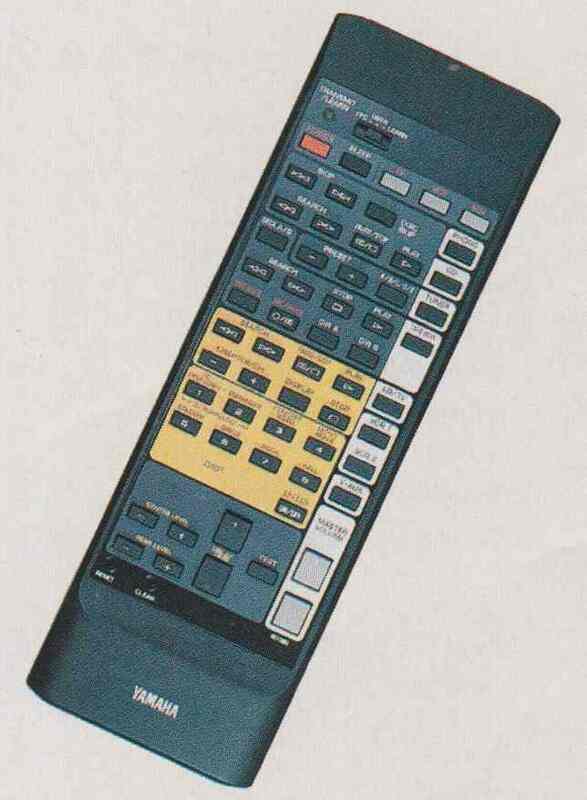 The remote is nicely laid out and especially well labeled for receiver-only operation; those who take advantage of its code-learning capabilities may get lost in the too-regular layout of the additional controls. Now for the exception, which applies to all the surround modes except plain Dolby Pro Logic. The RX-V590 is the first Yamaha DSP product we have encountered to leave out what I consider an indispensable feature: the ability to reduce or remove the DSP- generated reflections from the front speakers. Although the added reflections may produce an effective show room demonstration if only by making the receiver sound obviously different from its competition in our tests the digital echoes, depending on the mode selected, produced changes in the frontal sound quality ranging from a slight hollowness to a dialogue-obscuring spaciness in Dolby Pro Logic Enhanced. In previous Yamaha DSP products I’ve reviewed, there has always been a way to reduce or eliminate those effects, either by turning the frontal re flections down or even off (with a “front-effect” level control) or, better, by feeding them to separate front ambience speakers placed apart from the main front left and right speakers so that the “reflections” and the main front-channel sound come from different directions. With the RX-V590, you are stuck with Yamaha’s factory set tings for the front-effect level, which I feel are too high. This is particularly disappointing because previous Yamaha components with DSP-based ambience enhancement (which the company pioneered) have consistently sounded more realistic than those of most of its competitors and have usually been easier to adjust for optimum performance as well. On the other hand, how you respond to the sound of the processing will at least to some degree be a matter of taste, which means it is possible that you will find the RX-V590’s ambience-enhancement modes more appealing and useful than I did. And few other receivers even try, much less succeed, to offer anything as sophisticated in this vein as the RX-V590, so you won’t necessarily find competing models superior in the ways they handle modes other than Dolby Pro Logic. As for unenhanced Dolby Pro Logic, you can take heart in the fact that the RX-V590’s implementation of that most critical processing mode per formed exceptionally well, decoding Dolby Surround soundtracks cleanly and accurately. And the RX-V590 has ample power reserves for all but the most insensitive speakers or the largest of listening rooms. The RX V590 is likewise a worthy contender, for its price class, in terms of features and ease of operation. If the additional processing modes are very important to you, then, as usual with that sort of thing, listen before you buy and choose accordingly.